So, that's it folks. The last of summer! I am sad to see such beautiful, vibrant produce go away, but ready for all the hearty gourds of Fall. Plus, I LOVE Fall weather and the colors, and the smells, and the fact that I get to start using my fire place and blankets! I know I haven't been around much this summer, but moving into our new house proved to be a bit more time consuming than I thought!! We found ourselves wrapped up in many little projects with any free time we had outside unpacking. But, with summer floating away in the approaching Fall winds, I figured it was time to jump back into the blog, my happy place! Again, I am including shishito peppers in my post, but they are not the feature this time, corn is. And since corn will only be around for a few more weeks or even days, I thought I would end the summer on a nice refreshing and filling soup. Corn is one of those vegetables that I absolutely love, but have a really hard time digesting. Unfortunately, I can't eat a lot of it at once and it has to be cooked, and cooked well. 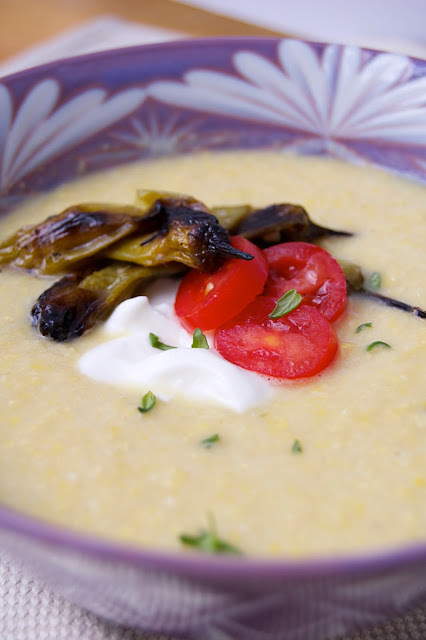 Soup is always the best way for me to get a lot of vitamins and minerals from vegetables, so this corn soup recipe emerged. Plus, I have to include some corn since I married a Mid-Westerner! Cut the kernels off the ears of corn, reserving the bare ears. Using the back of a knife or spoon, scrape the bare ears, removing as much of the “milk” as possible. Set this aside. In a large soup pot, heat the olive oil over medium heat and add the onion and shallot and a pinch of salt. Cook this for about 5-7 minutes, stirring occasionally until the onions are softened. Add the corn, “milk” and garlic and continue to cook for a few more minutes, stirring again. Pour in the water, thyme, pinch of salt and reserved bare corn ears. Cover and cook for 30 minutes. Remove the corn ears from the soup and move the pot off heat. Using a blender or immersion blender, blend the soup until it reaches your desired consistency. Chill the soup for at least 4 hours before serving. To prepare the seared shishito peppers, heat a thick bottom pan or cast iron skillet at high heat. Add in canola or Grapeseed oil (a high heat oil) and heat. Toss in the peppers and sear in the pan for a few minutes per side...doesn't take much. 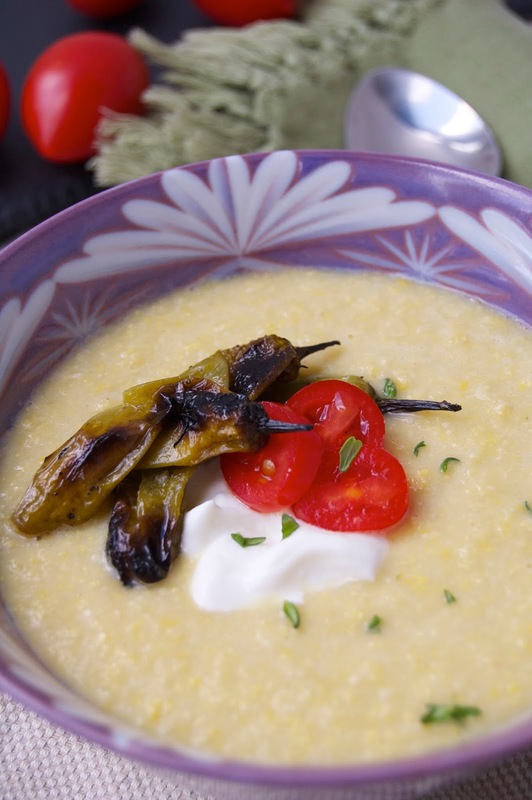 Once the soup is chilled, garnish with the seared shishito peppers and sour cream or creme fraiche. We like to add some sautéed chorizo sometimes or fresh tomato slices too! 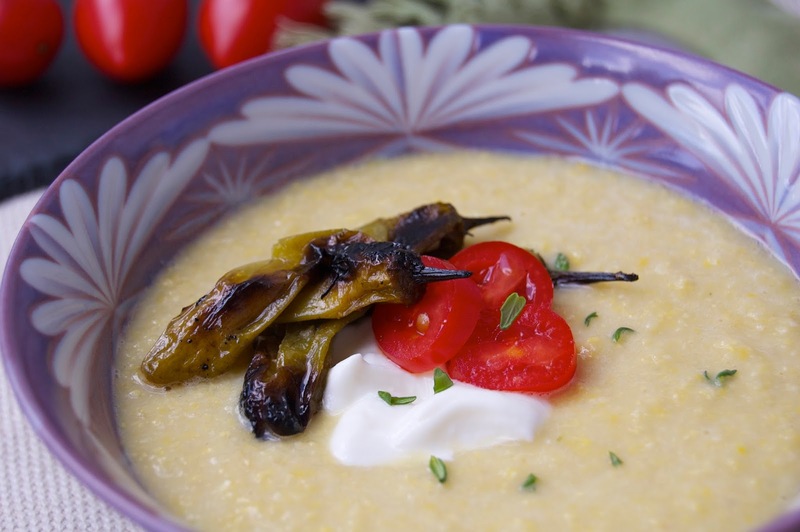 This soup is a great idea for breakfast!